Hubs and I are celebrating our 7th wedding anniversary. As part of our celebrations, we write one another a letter as we did on the eve of our wedding. I think I fall more in love with him each year as I write that letter and reflect on our time together. I have two cards for hubs this year to go along with the letter. This is a little 31/4 by 31/4 inch card. Its sweet and silly inside. The stamps are from Simon Says Stamp, Clearly Besotted and Avery Elle. I used Copics for coloring, memento ink for stamping and spellbinder dies for the layers. This is my serious card for hubs. The stamp set used for all but the Happy Anniversary is from a Penny Black set that my sweet and talented blogging friend Greta (thank you again!) sent me. I stamped and clear embossed the graffitti heart then colored it with Barn Door distress ink. My over panel was stamped with the birds and I added the Happy from Clearly Besotted and the Anniversary from Avery Elle to the sentiment stack. I used a spellbinders Heart die to create the partial heart window. I finished the cut with a craft blade around the two birds. This panel is popped up. Red, Black and white were our wedding colors and I love using them for hubs' anniversary card. I hope you all have a wonderful weekend and thanks for stopping by! I have had this card in my head for quite a while. 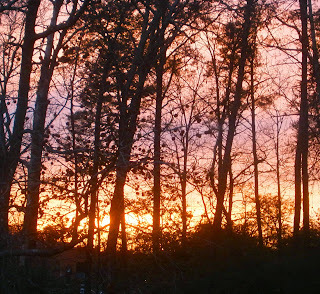 It is inspired by the view out my window at sunset. I finally managed to snap a picture one March evening. Then the hunt for the perfect stamp began. I found Tree Line by Stampendous and I thought it fit the idea. My first attempt at this was not an overwhelming success. I had water colored the background, and the stamp is just too detailed for watercolor paper. A couple more tries using dye inks and sponging, and distress inks...gave me beautiful backgrounds, but the stamping...yikes. I decided to give it one more try, and that Misti really made the difference. I stamped the treeline several times using Ranger Archival black ink. Those trees needed to be really dark and solid to contrast with the sky. I used distress inks in Worn Lipstick, Milled Lavender, and Spiced Marmalade to create my sunset. It makes me happy when the idea in my head actually looks like the card in my hand! I am back from California and had a wonderful time visiting my Dad. Its always a bit emotional when it comes time to leave, and this time was no exception. I miss my Dad, and am glad we talk, text and face time to keep in touch as well as play in the same poker league on line. Jack and Digger are cute as ever, and have grown to be quite good hunters...I fear for the bird population; and the lizards...so many I saw scrambling around were missing tails...My Dad rescues them and puts them back outdoors when the cats bring them in. Here are recent pictures of the boys, while not siblings, they are very close in age...a matter of maybe a week. They are the best of pals. Another card for Hubs, sure am missing him while in California. I took out the my new Distress Markers in Fossilized Amber and Abandoned Coral along with old favorites Vintage Photo and Forest Moss and had some fun playing with new to me WPlus9's Fresh Cut Containers. I stamped the distress inks, then played with a 0 round tipped brush and just a tiny bit of water. Where ever I wanted more color, I used the marker direct to paper. The sentiment comes from Simon Says Stamp's Friendship messages, it has a perfect font for watercolor cards. 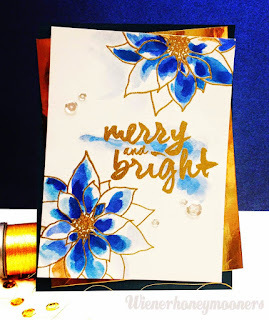 I was definitely inspired by Jennifer McGuire's cards from this post, for the design of my card. I really liked the concentric circles and the multi levels around the main image. I have had this WPlus9 Pretty Peonies set for quite a while, and I am always second guessing my results. This time, I had some fun with the set. I used water color paper, and distress inks for the color. I first stamped the third image of the three step flower, you can see in the picture the darkest areas. Next I used a very small brush with water to move some of that color around. The biggest help though was to take the stamp that covered the most area, and dip it in water and then stamp over the details with the wet stamp. Then I moved the water colors around a bit more. After letting it dry, I again stamped the details with full strength distress ink and barely touched those new inked bits with a damp brush. I am so glad I was finally able to make some peonies that look lush! I completely skipped the second layer stamp--only because this was a water color. When stamping with dye or pigment inks, I would use all three layers. You'll probably see a lot more of these water color peonies from me, now that I have a handle on using them. After coloring the peonies, I cut two circles at the same time from the water color piece. The small frame circle, I water colored with the same distress ink as the flowers, and mounted it flush to the card base. The center and outer water color paper were mounted with foam tape. The sentiment is from Simon Says Stamp Friendship sayings. A few enamel dots and the vellum sentiment strip finished this card. I just love Lawn Fawn's Hedgehugs stamp set. It is just adorable. Of course Hubs will be the first recipient of a card made with these cuties. I made the card before I left for California to visit my Dad. While I am visiting my Dad in California, I often make a few cards ahead to send to hubs while we are apart. Here is my last "live" card for this month. I am heading to California to visit my Day and won't be back until the end of the month. I have prepared blog posts for the interim, so please keep stopping by! I was quite taken with Michele's Muse card...so elegant yet easily masculine with its clean lines. I grabbed Simon Says Stamp Square saying stamp set and matching die and crafted. I also grabbed the Wishing die, SSS Lipstick Red ink and some Ranger Platinum embossing powder along with Versamark. This card will be in hubs' mailbox the day I head out to California. I placed that last square outside the frame for emphasis...its not in the right place...as hubs isn't nearby. I will be visiting your blogs as time permits. Thanks for stopping by! 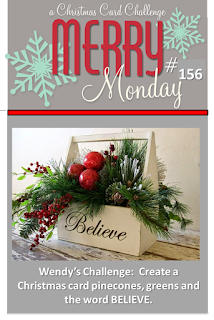 One of my favorite challenges, Muse now has Muse Christmas Visions as a challenge blog. I am sneaking in at the last moment to participate in the inaugural challenge. And what a gorgeous inspiration piece we have by Kimberly Wiener. I loved those bold blues, and the gold with the white. Her tilted layers behind the front panel really add extra richness. 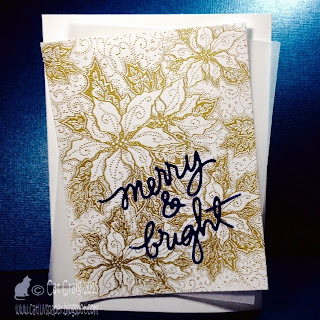 My supplies included a Stampendous Poinsettia background stamp, Essentials by Ellen Merry & Bright die cuts, Vellum, Hero Arts Gold embossing powder and Neenah white index card. Another card for Leslie's challenge at The Crooked Stamper. Very similar to my last card, just a color change. That gold is very difficult to photograph. I like the girly feel of this one, but it doesn't have the impact of the first one I made in this style. Stamp- Hero Arts, Inks- Distress and Hero Arts. Thanks for stopping by. 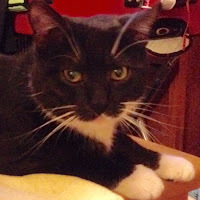 Leslie's challenge is open until Thursday May 21st, 11:55 PM EDT. 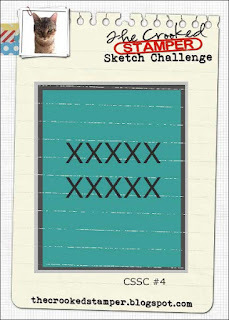 I was bummed to have missed the third sketch challenge over at Leslie's blog- The Crooked Stamper, and I knew I would have to complete my card early this time not to miss it again. The challenge runs to Thursday, May 21st, at 11:55 pm EDT. I was rushing again to make a last minute deadline for a challenge blog. 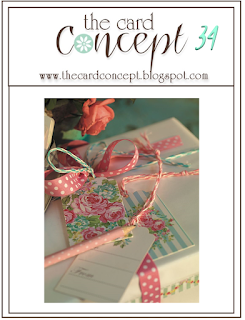 I loved the mixes of polka dots, stripes, and lush pink flowers in the inspiration photo at The Card Concept. I took a bit from the blue stripes, the tiny bit of yellow on the tag and those two toned pink roses, just a bit different than the color of the polka dotted ribbon. I'll call it clean and simple, although the tag and bow are layered on. I have had these memory box window, shutter and flower box dies almost since I began card making in 2011 and I have never used them. I wanted to make a special card for my MIL --- She is an absolutely gem. She is kind, loving and one of the nicest people you will ever meet. The shutters and the window box are also three layers thick so they are sturdy. 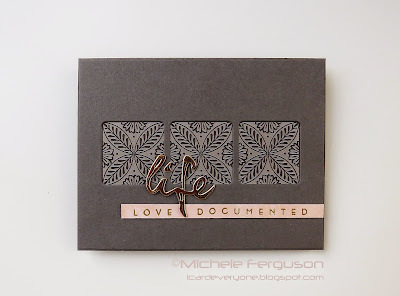 My card front panel is dry embossed with a Tim Holtz/Sizzix brick embossing folder then lightly inked with antique linen distress ink. The entire front panel is mounted with fun foam onto a white card base. I decided to leave the front sentiment free. Thanks for stopping by...and Happy Mother's Day all of you who take care of others in one way or another. The theme for Shopping Our Stash this week is the Big, Bold and the Beautiful. I chose a big beautiful stamp by Penny Black. I stamped a portion of it several times, heat embossed in white, and used Koi watercolors in several layers drying it between each to create bold color. The sentiment is from SSS's Friendship messages. I saw this new challenge today. I took a few liberties with the sketch, but I think you can still see it in my creation. I used WPlus9's Pretty Peonies for my main focal image. The challenge is open until May 29th, give it a try! Just click on the challenge graphic for a link to the challenge page. My bestie is having a birthday this month. I started with the frienship background embossed with clear powder on vellum. It is a great texture, and only in a certian light fall can the words be seen...kinda like a secret message. My next task was to prepare a watercolor background for under the vellum piece. I used the Koi watercolors with a mix of blues and purple. While that dried, I die-cut the Memory Box Vignette Floral Branch and colored it with copic markers. I did not pull the die-cut apart to color it. Since it is so delicate I left it within the sheet and only separated it once it was colored. My bestie's favorite color is pink, so I took a bold pink card base and began layering my elements. The contrasting light pink mat, the darker pink base, watercolor piece, the vellum, and the die cut - now adorned with some wink of stella shine. I colored a few pearls the various pinks in the flower and placed those as flower centers. I also took some natural color pearls and scattered them along the card. My last bit was to wrap some pink chevron ribbon around the card as an anchor for the branch. I love how girly and delicate this turned out. I think she will love it too! Happy Birthday dear Evelyn! I saw this sketch at Case this Sketch and I knew exactly what I wanted to do, and my card is very representative of the picture in my head. Yea~! I used some 140 lb cold press watercolor paper and my Koi watercolors to create a very bold hot pink background area. On top of that is some gold embossed vellum using WPLUS9's Pretty Peonies, and the sentiment comes from SSS Friendship Messages. Embossing Powder is from Hero Arts. Attaching vellum is always a bit of a trick. I decided to glue it down with tape glider and then covered it with a bit of gold foil paper. The water color panel was matted onto an SU Strawberry Slush card base. It has been a while since I played at Merry Monday. The prompt this week was to used Pinecones, Greens and the word Believe. I used the Simon Says Stamp & Clearly Besotted stamp set Holly Berries. It has my favorite pine branch and some lovely pine cones. I didn't have any dies or stamps that say "Believe" but I was able to print it on vellum using my laptop and ink jet printer (set your paper settings to transparency).